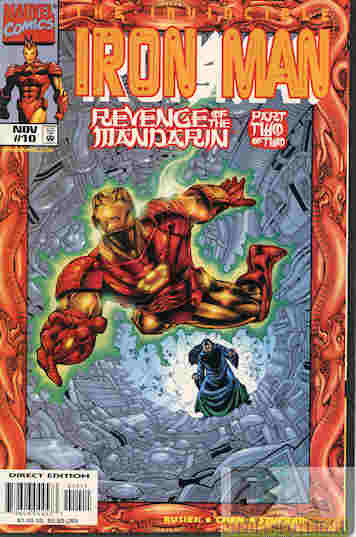 As the Avengers and their Russian counterparts try to break into the Dragon Of Heaven, Iron Man is held prisoner by the Mandarin. It takes time as the two discuss employer and employee versus master and slave, but Tony soon realizes how Mandarin is keeping him down and breaks free, eventually finding and destroying the ship’s power source. 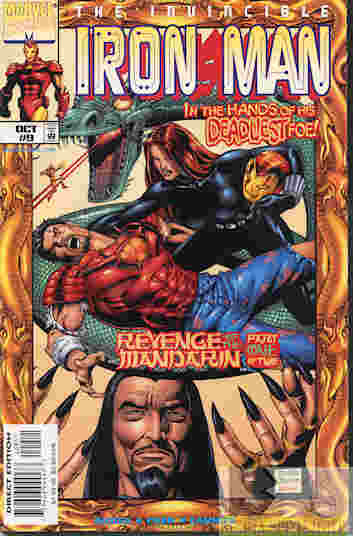 The dragon falls but Tony is sure the Mandarin has just faked his death this time. Then he passes out. It’s been a long week for him, you know. Meanwhile, someone kills Madame Masque and assumes her place. What they got right: The Mandarin’s return is welcome as Iron Man’s most dangerous foe. The aforementioned discussion was interesting but not preachy like you see today, but a natural conversation about their differences of opinion and Mandarin’s new (yet still warped) perspective. What they got wrong: Mr. Busiek, I’m usually a big fan of your work and I do really like this story, but why were you turning into Simon Furman here? The assassin subplot is STILL not over because yet someone else sent some of the people to kill him and now we have the beginning of the recurring dead Madame Masques (yes, plural, as you’ll see in later reviews). Can we just find all the assassin bosses and get this over with? Also a few panels don’t show us what the narration tells us is happening, like Tony’s escape through the ceiling and destroying one of the monitors Mandarin is gloating with. Recommendation: A very good two-parter. Pick these two issues up. Posted by ShadowWing Tronix on June 19, 2018 in Marvel Spotlight, Yesterday's Comics and tagged Iron Man, The Mandarin, Tony Stark.